Preventing Pressure Ulcers means ensuring that immobile patients change their position at least every two hours to relieve pressure. Both treatment and prevention of Pressure Ulcers require the right tools. The Patriot Rotational Mattress is an affordable support surface system that can provide therapeutic treatment for Stage III and IV, or multiple Stage II pressure ulcers. It works in either Low-Air-Loss mode or Rotational Mode. When switched to rotational mode you are prompted for rotation intervals. Rotation mode on the Patriot mattress means that it first turns one direction, and then, depending on the interval setting, turns the other direction. Turn Mode gives the care giver the option of 10, 20, or 30 minute cycle times. 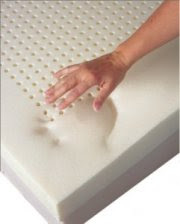 When in Low Air Loss mode the mattress provides 8" of true low-air-loss for a dry, comfortable, pressure-free surface. Read more about Pressure Ulcers and Bed Sores (Decubitus ulcer). Is It Just Snoring Or Is It Sleep Apnea? Sleep Apnea may be preventing you from getting the rest you need. Obstructive sleep apnea (OSA) is a serious health problem but many people don't even know they have it. 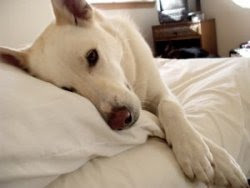 Usually it is the bed partner who first notices that the person is struggling to breathe. Snoring is not the same as sleep apnea. Snoring is simply a loud sound that you make during breathing while asleep if there is any obstruction in your airway. How can you tell if it's just snoring or OSA? When you sleep, your airway relaxes, just like the rest of your body. However, as it does so, it collapses and becomes blocked, or obstructed. When the back of your throat vibrates against obstruction, it's called snoring. For the most part, snoring is not really a medical problem. While it can be irritating to other people sleeping in the same room, most snoring doesn't cause problems. However, the airway can be so blocked that it completely blocks your breathing. Without air, your body cannot take in oxygen. Once your blood oxygen level drops below a certain level, the central nervous system triggers your body to gasp for breath. To do this, you partially wake up. This cycle can happen several times through the night. There are several problems with this scenario: First, the repeated cycle keeps you from falling into deep sleep which your body needs. You will be tired and irritable the next day and may not be focused enough to safely drive or to work. More importantly, the loss of oxygen can lead to memory loss, impotence, hypertension, heart attacks and strokes. If you think that you or a loved one has OSA, it is well worth the effort to see a doctor. He or she can rule out other causes and recommend treatments such as continuous positive airway pressure (CPAP) machines. These devices keep enough air flowing to keep the airway open. CPAP machines have been proven to help snoring and OSA problems. There's no need to suffer from snoring. See a doctor today and get some good sleep. This Miniwalk Gait Trainer is a perfect tool for teaching motor skills and balance. The seat and trunk support is easily adjusted to fit the child. The Miniwalk's seat slightly suspends the legs for free movement. Trunk is supported with comfortable padded bar that provides a secure feeling for the child. Seat height, handlebars and trunk support are all height adjustable. What's different about the Miniwalk is it's suspension system. It moves up and down during gait, allowing for a more normal heel strike, toe off and mid phase as the child moves forward. The spring assist system aids the child's “swing through” during gait. Human gait is measured from heel strike to heel strike, also known as the gait cycle or "one stride." The gait cycle has two phases, the stance (about 60% of the cycle) and the swing (about 40%). 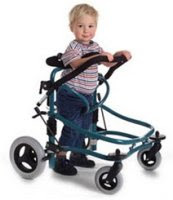 The Miniwalk Gait Trainer is available in 2 sizes and is designed for children 1.5 - 10 years of age. Our PreferredCare Mattress is specially designed for Adjustable Hospital Beds. Constructed without springs, the PreferredCare Mattress has 2" of Visco-Elastic Memory Foam on top and a 5" Polyurethane base for unmatched comfort. Perfect for homecare. Superior comfort for homecare patients. No springs in your back, just soft consistent comfort from head to toe. The 5" foundation provides a firm base. The top layer of Memory-Foam increases weight distribution to all areas of the body. The PreferredCare Memory Foam Hospital Bed Mattress supports your body ergonomically in a stable, naturally restful position. As you move, it moves with you, cradling you in real comfort. Anti-microbial waterproof cover with a 70 denier top to reduce friction and a vinyl bottom to protect the mattress. Mattress measures 36" Wide x 7" High x 80" Long. Wheelchair options like seat size are basic and apply to all chairs. However, some chairs require more information to configure. Frame style and type, back angles and height, front rigging options include swingaway and fixed, and some chairs need additional information for custom configurations. These options apply to both Folding Wheelchairs and Rigid Frame Wheelchairs. 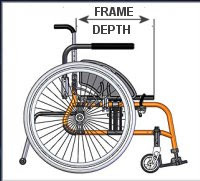 See a brief description of these components on our Wheelchair Options page. Get more information and learn how to measure for a wheelchair on our Wheelchair Measurements Page. The SmartPulse is a small, reusable fingertip oximeter that quickly spot-checks oxygen saturation levels (Sp02) for oxygen therapy patients. It offers fast, accurate readings with a full multi-color LED display for easy reading during the day or night. The large SpO2 display appears in green, yellow, or red depending on the user’s oxygen saturation levels. The SmartPulse is the perfect complement to the Eclipse 2 for patients who choose to check oxygen saturation levels during exercise or when traveling to higher altitudes. 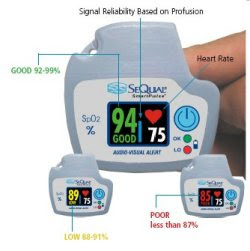 See the SeQual SmartPulse Fingertip Pulse Oximeter main page. For more information see Pulse Oximeter description. Finally, an affordable Bath Lift. The Sonaris Bath Lift fits in any tub and easily lifts up to 300-lbs. The Sonaris cost is less than half the competition's price. There is no installation, the Sonaris simply sits in the bottom of the tub and has suction cups on the base legs. The single button operation allows the user to descend and keep the backrest upright or to recline back to a more comfortable position. The Sonaris Bath Lift is powered by a rechargeable battery housed in the sealed hand control. And since the power comes from a low-powered battery, the Sonaris will provide a lifetime of safe bathing. See the full page on the Bathmaster Sonaris Bath Lift. New blood glucose system designed specifically for those who demand cutting-edge, auto code technology. The GLUCOCARD™ 01 appearance is similar to leading cell phone designs and unlike other glucose monitors on the market. This new, affordable system requires no coding, displays results in 7 seconds, and requires a tiny 0.3 microliter sample size. The GLUCOCARD 01 Meter has a 360 Test Memory and will connect to a PC to download the data in memory. The Glucocard 01 gets about 2000 tests on a single battery. Requires only 0.3uL blood sample for testing. Features a large, easy-to-read display for better viewing of test results. See the full page on the GLUCOCARD 01 Meter for more information. Excellent Caregiver tool. 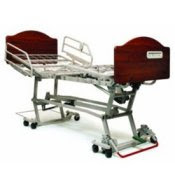 This Zenith II Full-Electric Hospital Bed makes working on the patient easier by eliminating caregiver bending. The Zenith II Long Term Care bed adjusts from a low height of 7.9" - to a high height of 30". Powerful DC motors, innovative Patent Pending design is engineered to keep the bed completely level at all times. The Zenith 2 has a sleep surface 36"W x 80"L.
Z-Lok function securely locks/unlocks bed to floor at all heights by depressing color-coded foot lever. Notice the optional Attendant Controls built into the footboard. The foot/headboards are available in 4 different woods: Solar Oak, Medium Oak, Montana Walnut and Windsor Mahogany. New Duet Rollator also functions as a Transport Wheelchair. The Duet has a flip-up footrest that allows the user maximum comfort during transport. When the footrest is flipped-up the Duet looks like a normal rollator with seat. The backrest flips from front to rear to provide a comfortable backrest when used as a transport chair. The Duet has a seat height adjustment, it's lightweight aluminum frame weighs only 19-lbs, and Duet has a 300-lb weight limit. Large 8" casters work well outdoors and indoors and make the Duet very maneuverable. 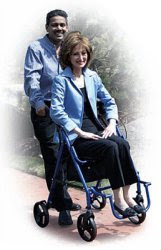 See the new Duet Rollator from Drive Medical.